This post is in reference to my 3D model of Charlie in Maya 2014. I then out him into a turntable. The final rendered video was edited on Adobe After Effects with some addition of match grain. This post is to show my process on how I helped developing a 3 minute kinetic/motion graphic animation under a strict deadline (6 days). I started production on the animation on tuesday afternoon, and finished on wedesday midnight; then I began finalising the video on thursday. – Structuring an appropriate story in an hour or two. – Coming up with a storyboard in an hour or two, or three. – Listing all the assets necessary for the animation in an hour. – Creating/collecting all the assets on the assets list before wednesday morning. – Developing an extremely rough version of the video by wednesday midnight. – Finilising the video with the selected audio by thursday. Right after I finished storyboarding the introduction, I picked out the music. The song is called “Graves” by a band called ‘The Color and Sound’. I had to make a Behance account for college use to which I eventually poured my time onto. The Behance account was used to blog my progress for making a kinetic text animation. I made a couple of flash animations. Designed the UI for a colour picker site for a college project. Had to pour some time into my photograpy. And also a working project I’m very proud of…. This my first post of 2013, oh so speshul. 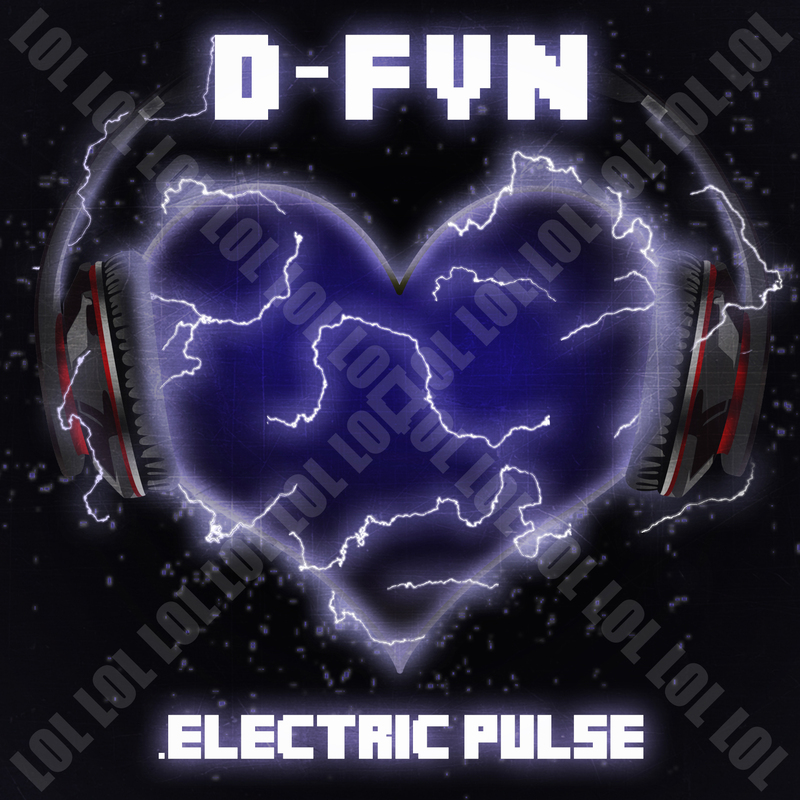 I was asked asked to design a cover for my friend, D-FYN’s EP titled “Electric Pulse”. So this is my reflection on achieving the final design. First off, knowing myself, my initial problem was going to be setting up the typeface and static. The main point of the cover was going to be a dark blue heart all static-y listening to Dre Beats headphones, so that itself for me was going to be handy enough. My first task was to figure out how I was going to layout the actual heart with the headphones. So did a few line drawings of a hear and headphones and to see what it would look like. 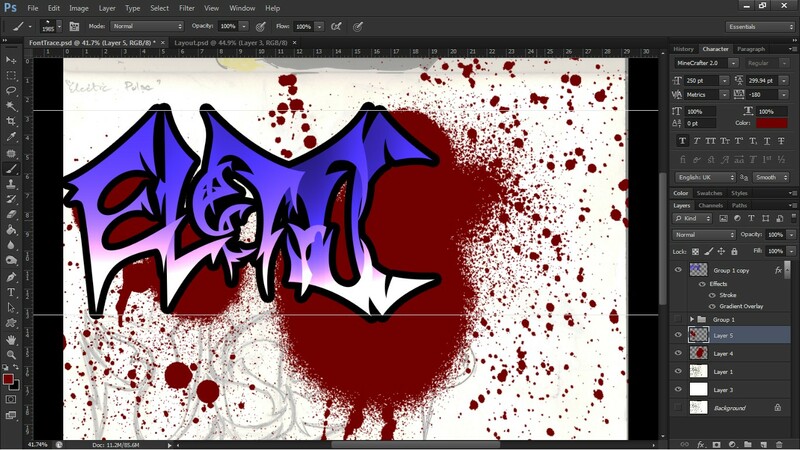 After sorting that out, in a matter of minutes or even seconds; I moved onto working on the font. That wasn’t so fun. Needless to say, in the end, I decided to use one of the fonts I already had on my laptop I got for free called ‘Minecrafter 2.0’ (yes I know, I used a minecraft font for a hip hop album). I gave it a glowing effect just to go with the electric theme of the brief. I had two initial designs for the heart and the headphones. The first with the headphones just in the middle of the heart. But after receiving some feedback, I decided to go for the second design, which was to have the headphones alongside the atrium of the heart. Getting the static effect on the heart was tricky. Originally I thought I had the gist of it, turns out its harder than it seems. Again, needless to say, I downloaded lightning preset brushes to get the effect I so desired. Of course giving it a glowing effect. It took me at least over a week to finish this design. I am still an amateur designer and should seriously use Illustrator for making vector designs, but for now I’m going to stick with my guns and opt for Photoshop making these raster images. So this is what I have come up with as my final design.